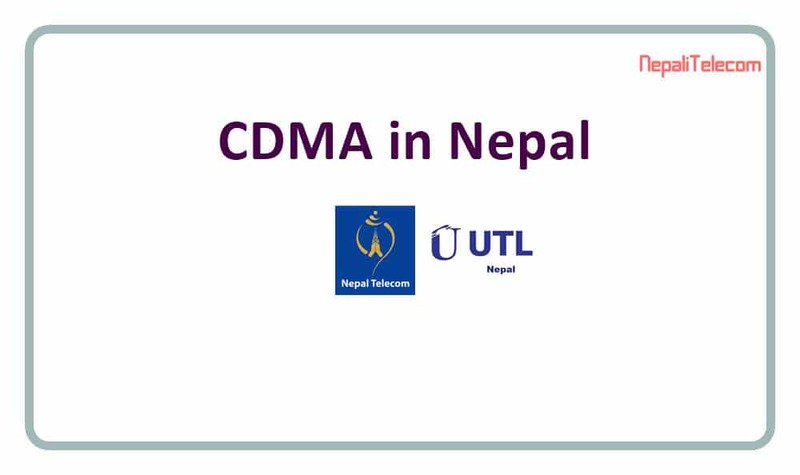 CDMA service is available in Nepal with two operators UTL and NTC (Nepal Telecom). First, it was with limited service mobility and then it became full mobility. There is also a WLL (Wireless local loop) service with CDMA idle for the places with no PSTN landline availability. Having served people in Nepal for more than 13 years, the CDMA technology and service usage are in decline. Here we will discuss the fate/future of CDMA service in Nepal. Latest MIS data shows a huge number of subscription of CDMA RUIM in Nepal Telecom (NTC). The number as per Mangsir 2075 is 1626211 (1.6 million). Such data from UTL (which we expect to revive with 4G) is not available there. From the recent trend, we can tell that the no. of actual CDMA users are very low. CDMA is one of the cellular mobile technology developed in the late 90s which also has its 2G and 3G service. You can get around 100 kbps of data service and Voice with 2G whereas EVDO (Evolution data only), the CDMA 3G service can provide internet speed up to 3 Mbps. Ntc has 2G and 3G CDMA coverage in almost all parts of the country. There is also a fixed phone service called C-Phone as a WLL, an alternative to landline phones. Ntc brands its CDMA service as Sky. Nepal Telecom (NTC) had already announced for not to invest more in CDMA technology. It is because of no further evolution in CDMA technology. That means there is no 4G of CDMA or some even say LTE is also the evolution of CDMA technology. With no more updates in CDMA technology and nonavailability of some services, handsets in CDMA, people now prefer GSM compatible technologies over CDMA. WCDMA (3G) and 4G LTE are GSM compatible technologies. The growth of CDMA users had also slowed down as GSM coverage expanded widely to more areas. People also prefer GSM over CDMA due to several features/services and also the popular handsets (both not available with CDMA). But there are still some remote areas, where CDMA service is only available and used for communication. CDMA will ultimately close down but proper options should be provided beforehand for remote areas with CDMA only coverage. With the Unified license, UTL also wants to operate 4G LTE service which is a GSM compatible technology. They are waiting for the necessary funds to operate GSM and LTE service. Read more here. Having a remote, uneven and mountainous terrain in Nepal, it is very difficult to provide mobile services to all parts of the country. CDMA has fulfilled the communication gap in those areas. But as it has no further evolution and no expansion happening, telcos will ultimately close down CDMA service like other operators in the world did. If the CDMA service closes down without any other option, the people residing in areas with CDMA only coverage will be affected. So, telcos need to bring new technologies like 4G to give an option for CDMA. 4G should provide the alternative of CDMA services (voice and data) with VoLTE and high-speed data. It seems like both telcos Ntc and UTL have the same plan. They can also use the CDMA frequency to operate 4G services.